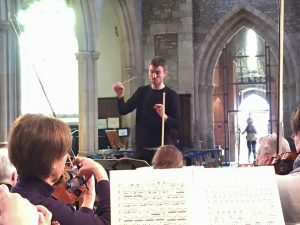 The North Wiltshire Symphony Orchestra (formerly known as North Wiltshire Orchestra) is a welcoming and friendly symphony orchestra, made up of musicians from all parts of the county and neighbouring areas. The orchestra was founded in 1966 in Marlborough and has been performing ever since. In 2016 we celebrated our 50th anniversary with a special concert and also took the opportunity to change our name from North Wiltshire Orchestra to North Wiltshire Symphony Orchestra to better reflect the make-up and repertoire of the orchestra. We rehearse in Rowde near Devizes, and have three concerts a year in St Andrews’ Church in Chippenham. Our principal conductor and musical director is Alex Arkwright. He conducts at least two out of the three concerts each year. Once a year we try to bring in a guest conductor. Previous conductors of the orchestra include Graham Smallbone (1966 – 1971), Christopher Finzi (1971 – 1997), lan Harwood (1997 – 2002) and Chris Thompson (2002 – 2012).